Olga brings us this week's challenge at There's Magic in the Air. 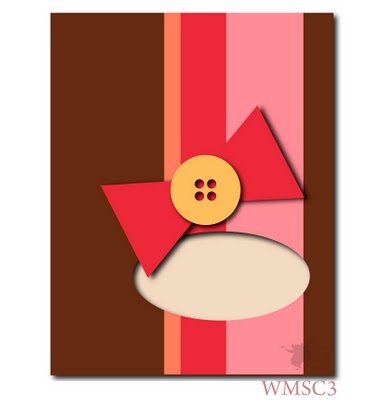 She wants us to use any PAPER CUPCAKES image and showcase it using on a box or container of some type. 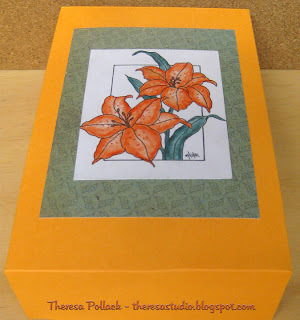 I have so many day lilies in bloom in the garden that I decided I would use this Lily image for the top of a simple box I made with 2 pages of CS and my scor-pal. Colored the printed image with pencils and OMS and added some glitter to the stamens. Matted on a scrap of green paper and attached to the box. Good size for a gift or maybe to hold copies of printed TMITA Images that I keep handy on my work station. That was an easy peasy challenge, Olga. Sorry to see Olga leave the team at TMITA. I will be traveling to Tennessee to visit family for a few days. I am writing some posts in advance because I will not be able to post on the road. But I am hoping to be able to check in and visit your blogs, say Hi, and leave some love! I love to hear from you too, my cyber friends. 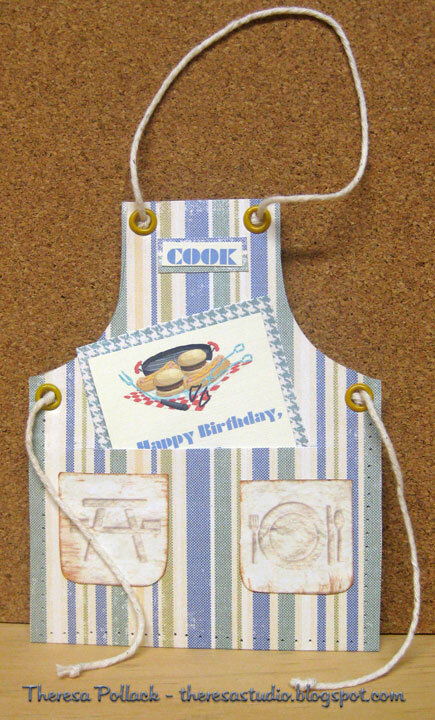 At Just Us Girls, Maria's week's challenge is to make an apron card. 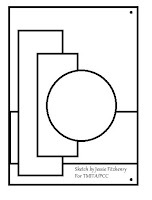 A free template is available to use from Mirkwood Designs. Check out the template HERE. 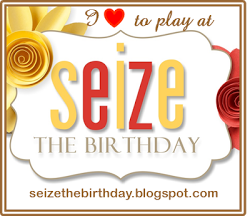 I made my card as a birthday card but the card slipped in the photo so you do not see that completely. Using the free template I cut the apron from striped CS and used grommets to attach the apron strings made with cooking twine. Added some pockets cut from a unknown PP and printed the birthday card on the computer adding some graphics and text. Matted this with anther PP. And also printed the word COOK on the computer. Apron is just right for a barbeque. Time to heat up the grill! This card was made for Linda's Blast from the Past Challenge over at Stamp TV. She challenged us to attach a button to a bow BUT there's a twist! The button has to be "unusual", not the normal two or four hole button. The hardest part of this challenge was to decide which button to use. ....I have sooooo many. I started with another button but after I colored my image with pencils I changed to this lovely green button in my collection ...this one has flowers imprinted around the center. If you enlarge the photo, you may see it better. 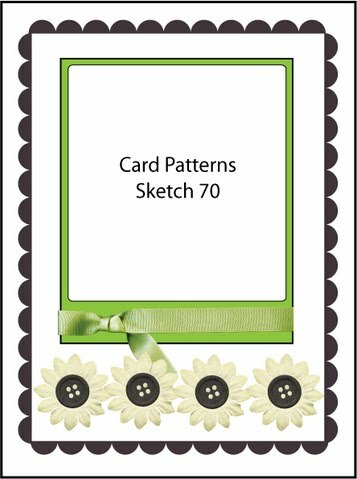 I used the sketch from Card Patterns which by the way is being sponsored by Gina K Designs this week. Stamp: GKD "Signs of Autumn"
I do wish I had a great story to tell about this button but I have no idea of its history! 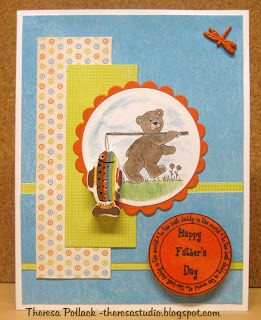 Made this card for the sketch challenge at Cards for Men. Changed the location of embellishments a bit because of weight of the button that I wanted to use. Used this coffee stamp that I have had for awhile ...thought it'd be perfect for a masculine card. Colored with pencils and OMS. My husband grinds and brews our coffee every day so will be using this card for him for some occasion. Thanks for dropping by for a cup of java. Stamps: GKD "Friends are Flowers" and "Botanicals"
Monochromatic cards are some of the most difficult for me to do. 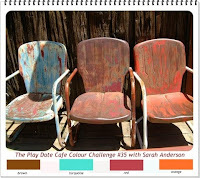 Using shades of brown seem to be the easiest to accomplish since I can use light shades of ivory to the darkest browns. I made this card using an old PSX stamp but one of my faves. 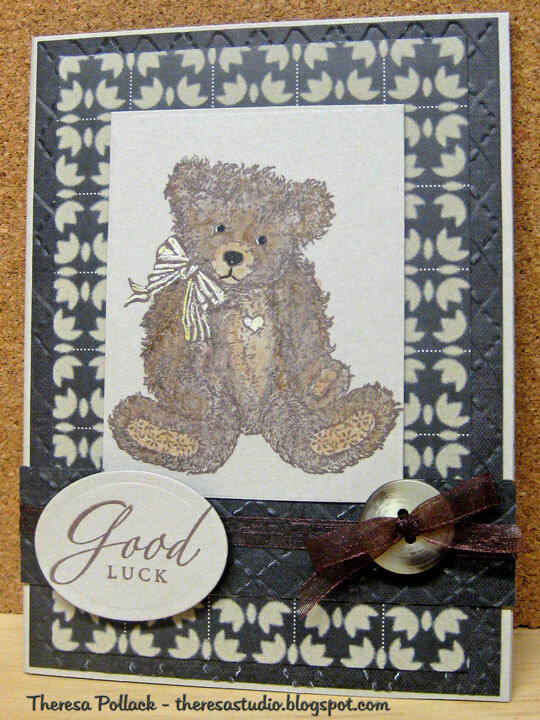 Stamped this cute bear with brown on sand card stock and colored with pencils and added touch of gold on his bow and heart with gel pen. Used a patterned paper that is flocked....love the texture of this... as a mat for the image and then layered on a darker brown mat that I embossed with the Cuttlebug Argyle embossing folder. 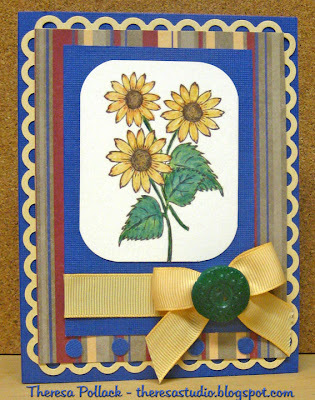 Placed this all on a base card of sand and added a strip of embossed dark brown with a button and bow. Finished with the sentiment on an oval cut out with Nesties. 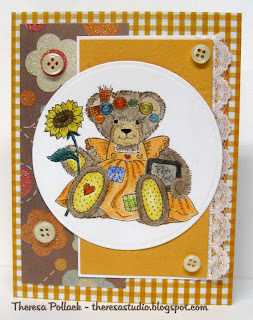 Cute Card Thursday: Reuse, Renew, Recycle! Used an old button saved from clothing and reused the ribbon. I have to cut down on the number of challenges...takes a while to link all these. LOL! I do not use the colors pink and purple very often but this Sassy Cheryl image "Grace" called out for them. Made this birthday card for her challenge. 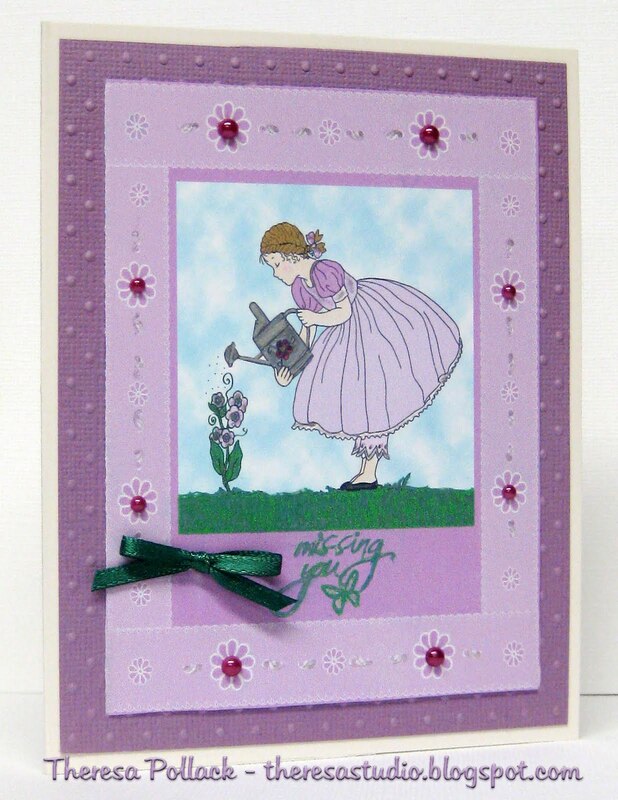 Used pink base card with purple mat embossed with Swiss Dots EF. Colored image with pencils and OMS and glitter pens. Stamped sentiment and added some glitter. Added some embossed flowers to the edge and organza pink ribbon. Used pearls for earring and on corners. In a drawer, I found this forgotten safety pin that I had threaded with pearls and added it to the corner. The Beary Scrap Team has a Beary Sweet fun color challenge: Navy, Turquoise and Lime. 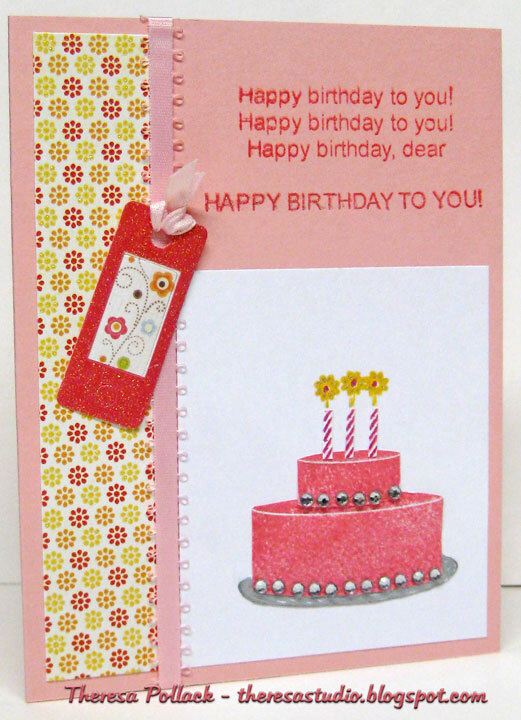 The card that I made is quite different from my usual cards in that it is "Sweeter"? 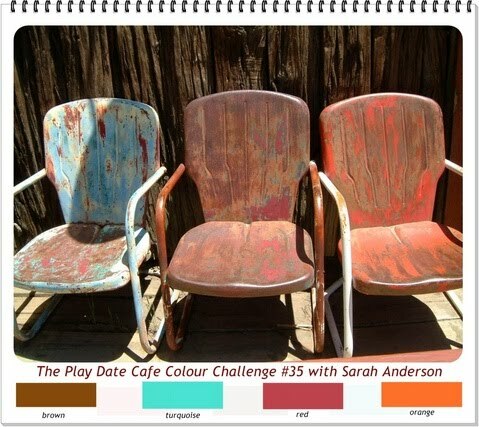 This challenge is open until June 30. 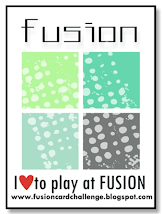 I used a new stamp from Your Next Stamp that I won from CAS-tastic - "Party Fhiona". I paper pieced her dress and colored her with pencils and glitter pens. I used the sweet sketch from Stamping 411. Papers used were Bazzill Navy CS, DCWV Patterned paper and scraps of Turquoise. Added flowers, brad, and ribbon. Have a beary sweet day! When I first read There's Magic in the Air's challenge to use an image of cats, I thought NO WAY am I going to come up with an idea for this....but....then I found some Basic Grey paper from Crystal's candy that inspired me. Pat's Challenge at TMITA was to use this week's freebie "Cats" by "Paper Cupcakes" and to use some spots on this week's projects; spotty paper, flowers, ribbon etc. 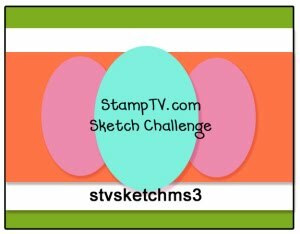 I used the sketch from Annabelle Stamp challenge shown below. Cut the stripes from Basic Grey "Max and Whiskers" paper pad.....used the spots and the cat print dp...how appropo! Printed the image and colored with pencils and OMS. Attached image to the card using a spotted mat. 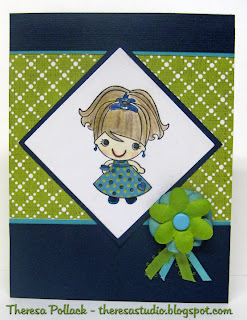 Added some gold rhinestone bling for the Annabelle Stamps Blogspot challenge. Stamp: GKD Sentiment "A Year Of Flowers"
Quote from Simon Says: "Friends are very important to all of us so why not show them how much we appreciate them always being there by surprising them with a card or gift ?" Linda's Blast from the Past challenge this week is Patterned Embossing. This is my first time for this technique. I had to do this several times to get it right. 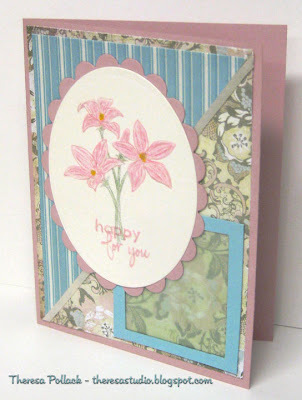 You can watch Gina's tutorial on Stamp TV here! 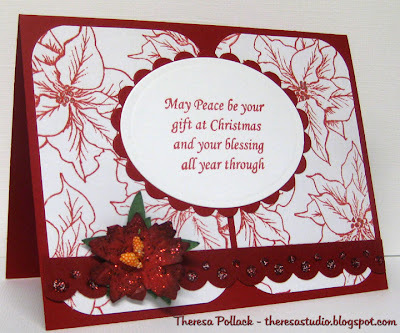 For my card, I used GKD poinsettia stamp from"Pressed Flower" by Melanie and script stamp from "Botanicals". 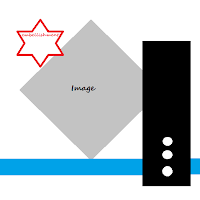 Used Nestibilities Label 9 to cut image and mat. Inks used were SU Regal Rose and Ruby Red. Used GKD Ivory CS and Red CS for base from Stash. 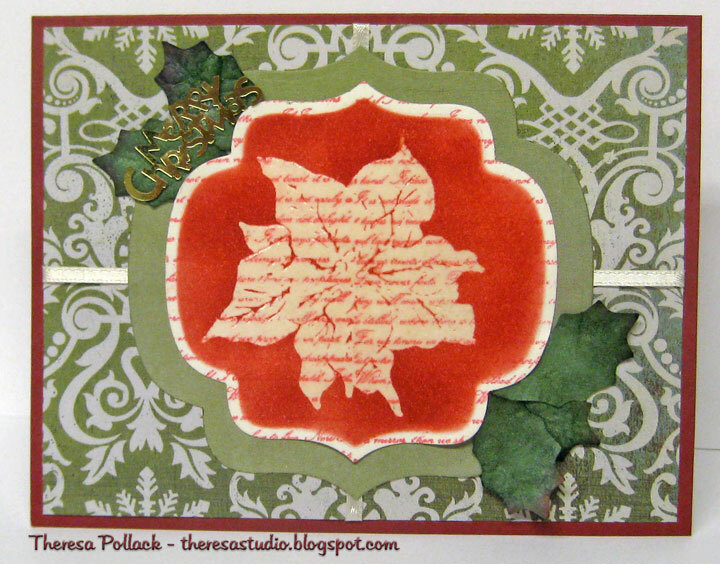 Patterned DP is from Basic Grey Figgy Pudding and Green DP is from Basic Grey Capella paper pack. Added ribbon, leaves and Merry Christmas sentiment in gold to finish. 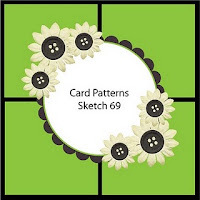 Card Patterns Sketch 69 for layout. Christmas Cards All Year Round: Use one bright color on card and a favorite embellishment. 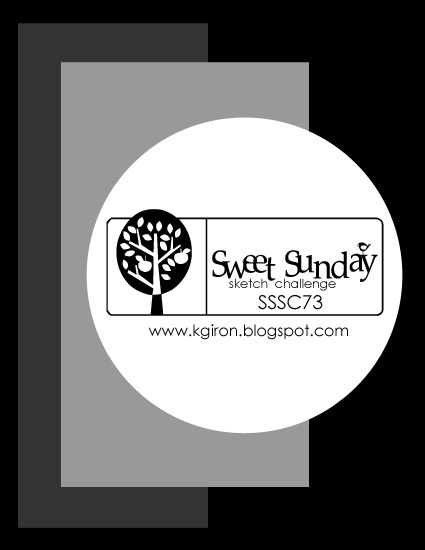 I posted this in time for STV Monday's sketch challenge by Melissa but just now sharing on my blog. 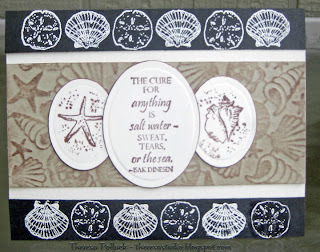 I stamped shells and sentiment using GKD "Gifts From The Sea " by Melanie. Shell border was stamped with versamark and embossed with White Seafoam EP. 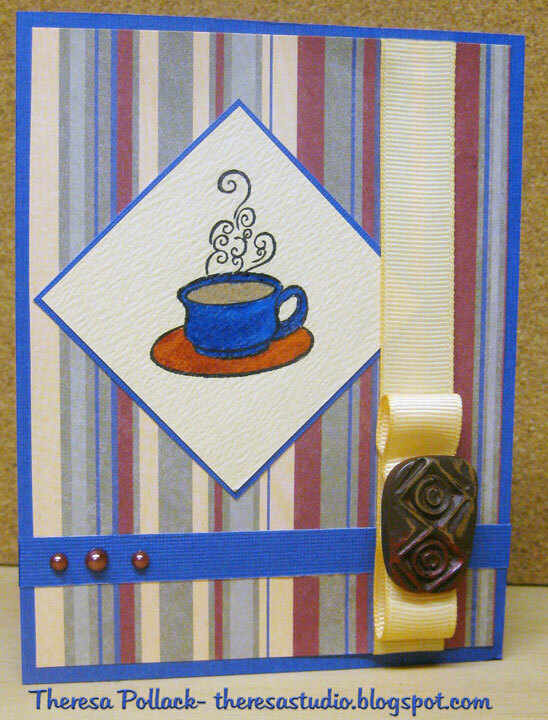 Cut ovals with Nesties.Used Spellbinders Impressabilites on the kraft cs and inked with Memento Rich Cocoa. 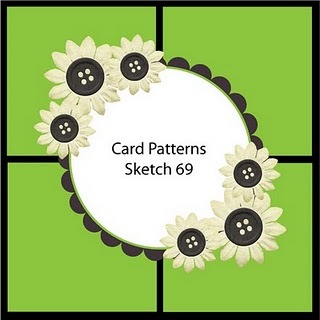 Cardstocks are from GKD neutral assortment pack. 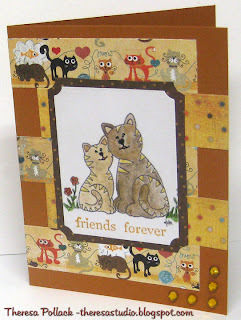 Speedy the Cat's Friends Challenge: Claudine has challenged us to emboss on a card. 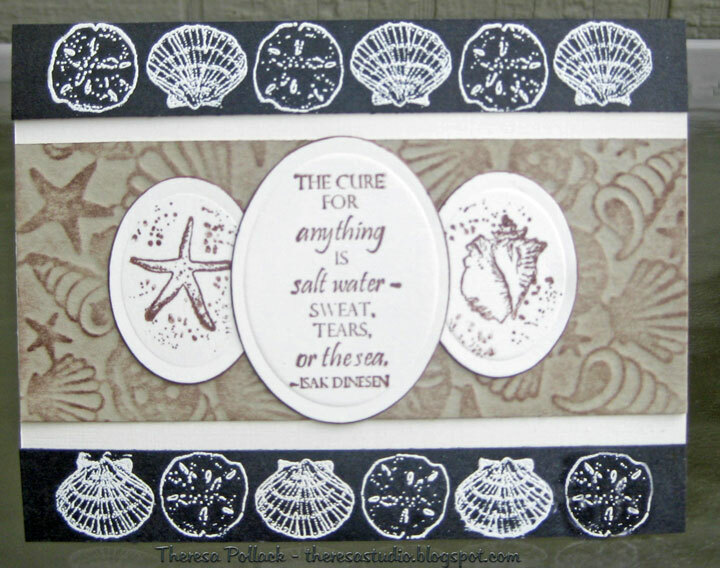 Used heat embossing on shell border. 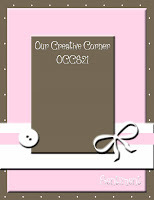 My friend Patti has requested cards to cheer her friend Jesssica who is confined to bed rest during her pregnancy. The details are here if you would like to send a card. Patti is offering blog candy and will draw a winner from those who send cards. Sending our prayers and thoughts out to Jessica. DP is K&Company, Green and Camel CS from stash. Ribbon is GKD. Sentiment is from GKD Botanicals and stamped with Memento Bamboo Shoots ink.. Cut rose from DP and embossed with versamark and clear EP. Wishing the best for Jessica and her unborn son. She is fortunate to have friends like Patti. 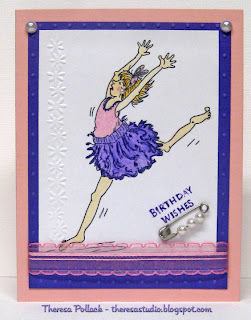 Today, I am showcasing a card that I received for my birthday last week. I received this lovely work of art from my friend and neighbor, Rita. 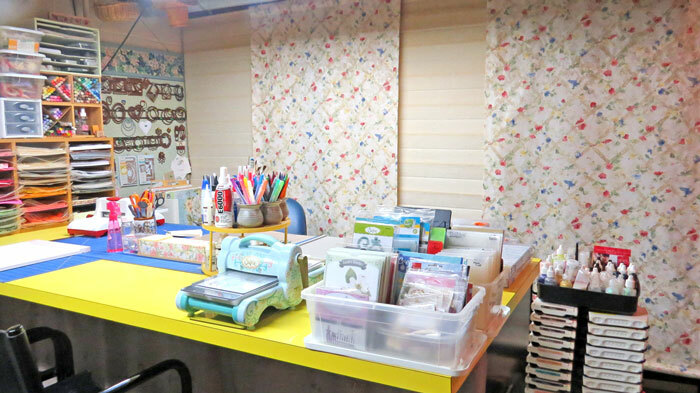 You may remember, if you follow my blog, that she is the one responsible for getting me started in rubber stamping.....a few years later and a few dollars less, I am hooked on stamps and paper crafting. She made the beautiful rose on the card with punches and colored, shaped and glued all those petals and leaves. She enjoys working with very intricate and minute pieces ...the smaller, the better it seems. Actually these petals must have seemed large to her compared to some elements that she uses in her projects. 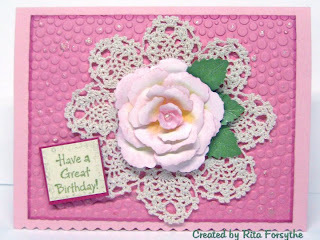 Although Rita is an excellent knitter and crocheter she purchased the crochet doily on the card. even better those who share our interests? Received some new GKD stamps this week and was anxious to use. Carla's color challenge at STV was purple and green plus one light neutral and one dark neutral. So I pulled out my new Botanicals stamp set and some Chocolate Brown, Ivory, Creme de Menthe and Violet GKD Pure Luxury Cardstock and set out to make this card. Brown is the base (looks black in photo) with mat of ivory and mat of green embossed with CB EF Diamond Plate which I won last week from Crystal. Stamped background on ivory with Memento New Sprout and then stamped flower with SU Eggplant and Memento Bamboo Shoot inks. Matted this on Lavendar. 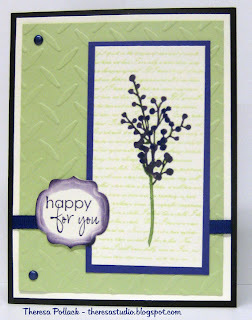 Sentiment was stamped with SU Eggplant ink and cut with Nesties Labels 9. Added some ribbon and couple of purple brads. So much fun to use new supplies and stamps. 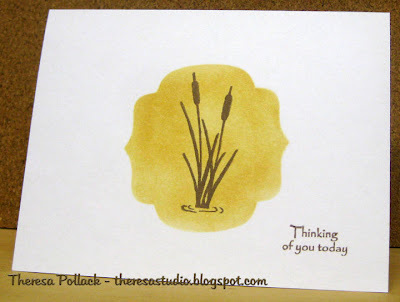 This week's One-Layer Wednesday Challenge was to use a flourish on your card. Small or large, one or more, it doesn't matter. 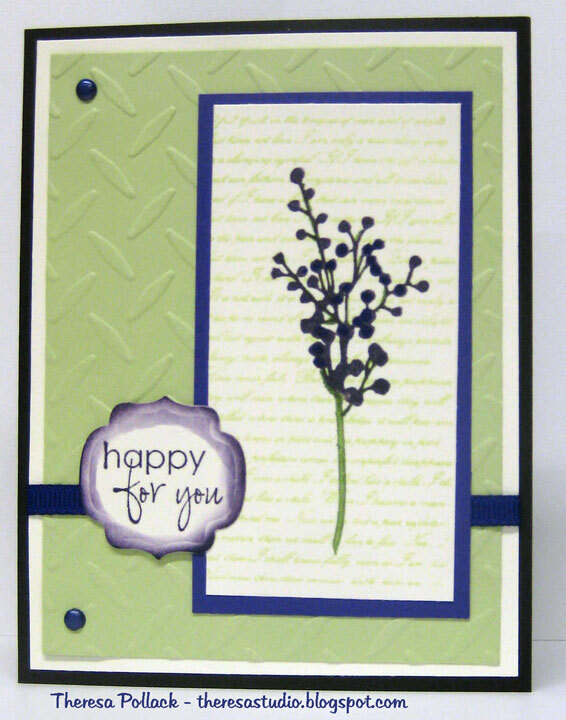 I forgot I had this flourish stamp that is in the Creative Clear Stamp Set "Hello Hunny". I stamped it using SU Really Rust ink on the 4 corners of ivory cardstock. Stamped a Monogram in center with Inkadinkado alphabet clear stamp. 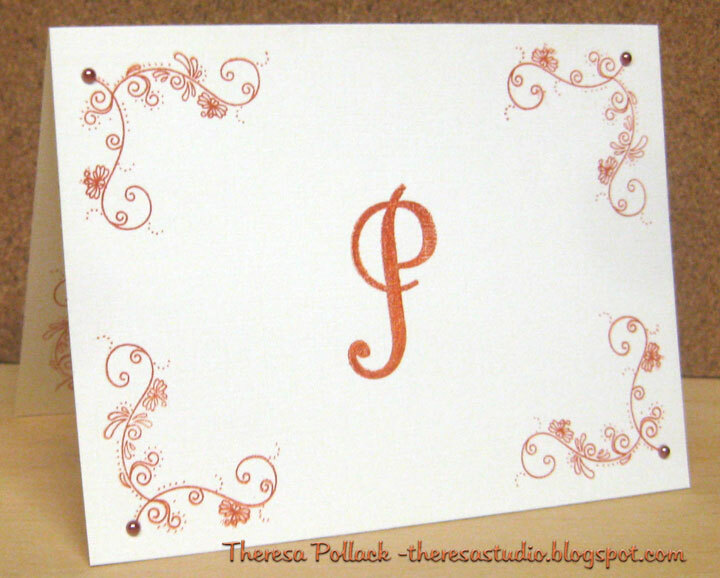 Added some Kaisercraft rust pearls and now I have a great monogram notecard. Easy to make box sets of these notecards for personalized gifts. You can do 1, 2 or 3, or combine both, or do all 3. I chose to combine 2 and 3 using colors from the photo and music. 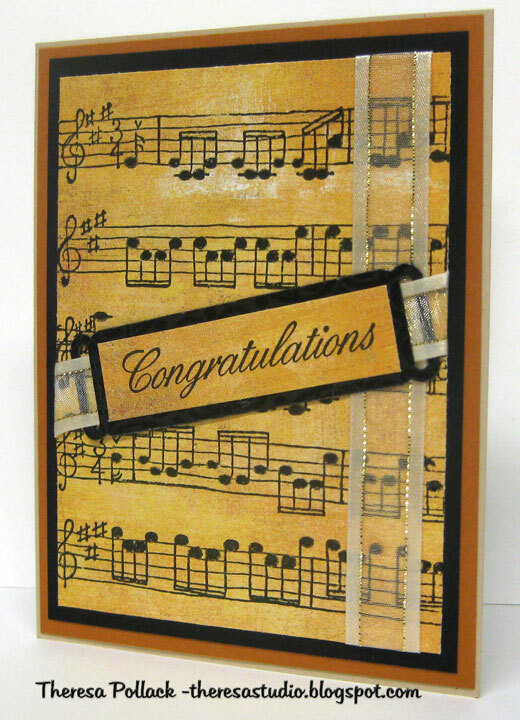 My card was made with a music stamp and papers in rich colors. I really like the final result. 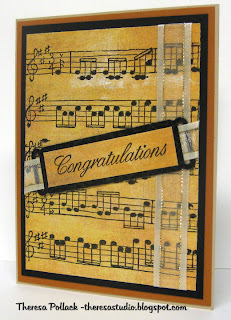 Stamp: JLR Design Co "Sonata"
Other Challenge entered: Really Reasonable Ribbon- Use ribbon as a border. Have a good weekend. Thanks for dropping by. I love my teddy bears and love to make cards with bear stamps. 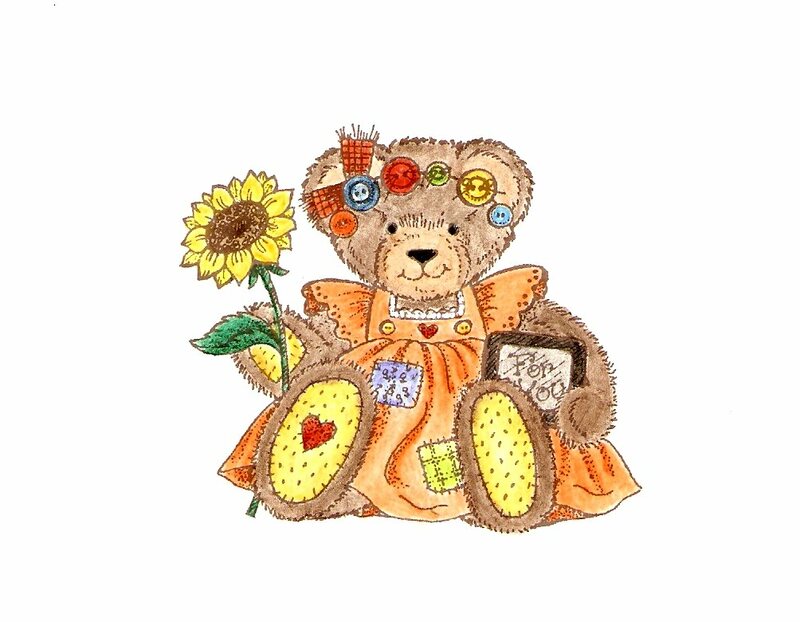 This card is an old stamp from Hero Arts "Bear with Sunflower". She is all ready for summer in her sundress and loves sunflowers. I colored her with pencils and OMS and added some accents to her button headband and the frame. Used a glitter printed paper and a solid cs dry embossed as mats but does not show too good in photo. Used a gingham check cs for base card. Added lace and buttons for some bling. 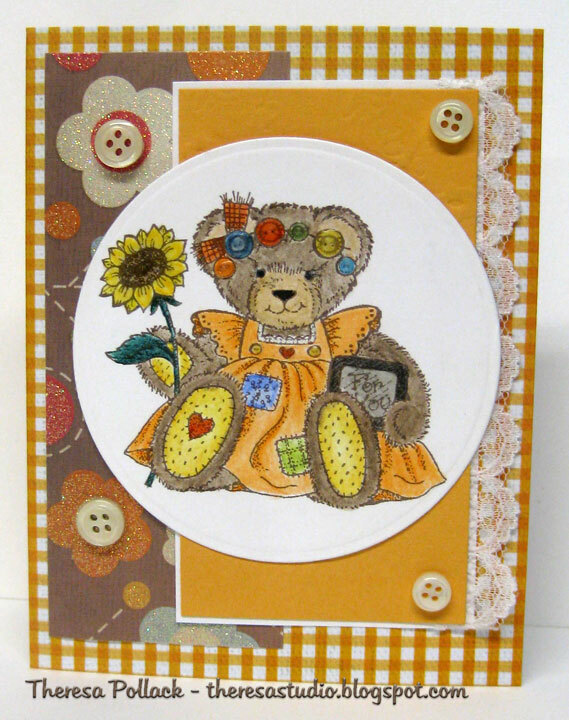 Stamp: Hero Arts "Bear with Sunflower"
Just Cute Bears Challenge: Theme is "Here comes summer." At There's Magic in the Air, Patti brings us this week's challenge. 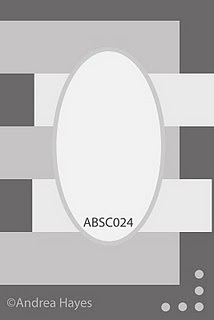 The challenge is to use a PAPER CUPCAKES image and do a Monochromatic theme project. 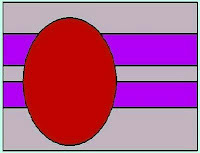 The monochromatic does not have to include the image although I used red in the image. 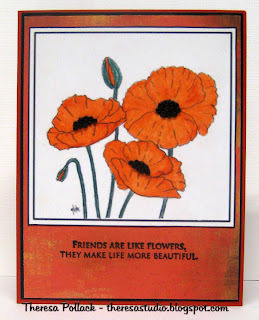 I purchased this new release "Poppies" to use in this challenge...love this flower and the image by Nina. Poppies are such a fun flower! Hope you pop some fun into your day. PS:My name was drawn at random. 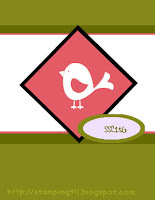 I won a digital stamp from Paper Cupcakes. This card is for Stamp TV Xmas Challenge from Giovana to make a card with the sentiment to be the focus. Stamps: GKD "A Year of Flowers" and "First Christmas"
Over twelve years ago, I first started making cards using only the computer and a couple of software programs-The Print Shop and Photoshop Elements.. Then I got into stamping and began to use more elements in my cards. Lately I have begun to use more digitals images and techniques so that I am now using the computer more in card making. 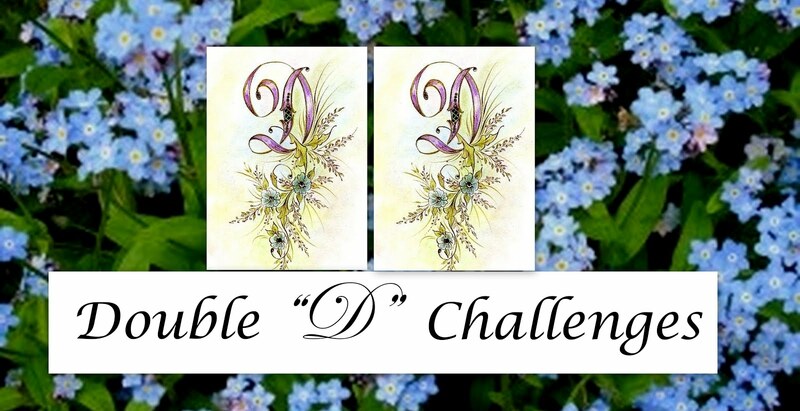 Pam at Just Us Girls challenged us to a digital challenge this week by using a digital image on your card or using digital paper for our card or do both. I used a digital image from Isabella's Sketchbook "Mary, Mary" that I colored using Photoshop Elements and added the sky background using PS. I also added a digital lace border (unknown source) and a digital sentiment from Ann Vento of Raindrop Echo Designs. I then printed the image and border and mounted on purple mat embossed with CB EF Swiss Dots. This was attached to a white base card. I added some glitter to the lace border, dress, bow, flowers, grass, and sentiment and added colored pearls to the lace. Not sure if you can see all the details in photo. Finished with a satin bow. Don't forget to water your flowers. 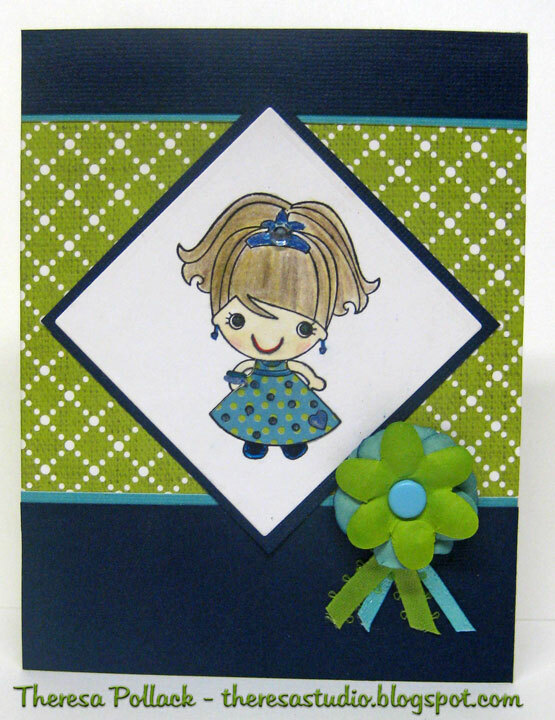 I discovered a new challenge that looks like fun- Stampin' B's Design Team. I like their Mission Statement: "We stamp for the utter enjoyment of stamping. Rules be damned! We will enjoy each other's creations by commenting on them, praising them, and NEVER having a negative impact on another person's stamping in any way!" 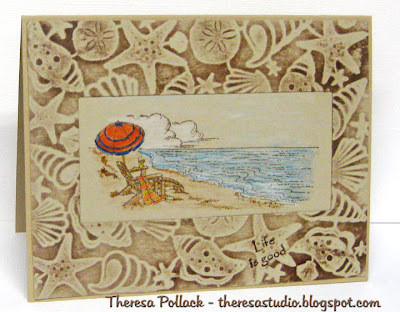 Their challenge this week is by Joanne- to make a Seashore Card. 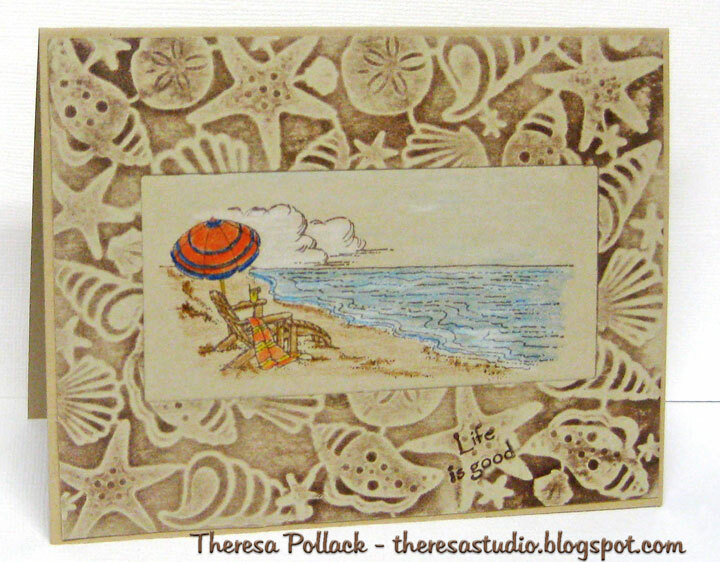 I used an old stamp from Stampendous " Beach Day" and stamped with Memento Rich Cocoa on kraft paper and colored with pencils and OMS. 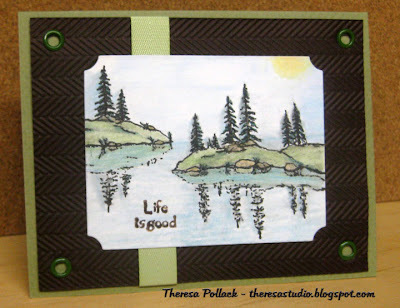 I used the Spellbinders Impressabilities Sea Scape to emboss a mat of kraft cs and inked with the Rich Cocoa. Cut a "frame" in the mat with Nesties Rectangle Die for the stamped image and assembled all on base card. Tucked a sentiment in the shells "Life is Good". Now I wish that I were by the sea enjoying the sound of the waves and the warmth of the sand. Want to join me? When I saw the inspiration photo from Brenda's challenge at Stamp TV, I immediately thought of a pad of papers that I had with bright stripes, circles and flowers and knew that is what to use in this card. In fact, I made 2 cards inspired from the photo-one a generic card that could be used for several occasions and one for a birthday. I let the papers inspire my layout. 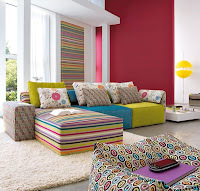 Looks like a fun room and so full of colors. Thanks for dropping by my blog "room" today. Petunias are such an old-fashioned flower and an all time favorite. 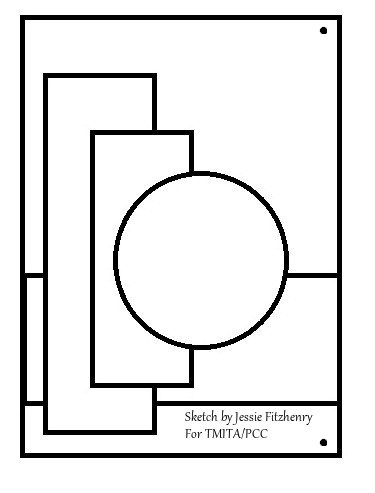 This week the challenge at Isabella's Sketchbook is to use one of her images with the sketch shown to the right. 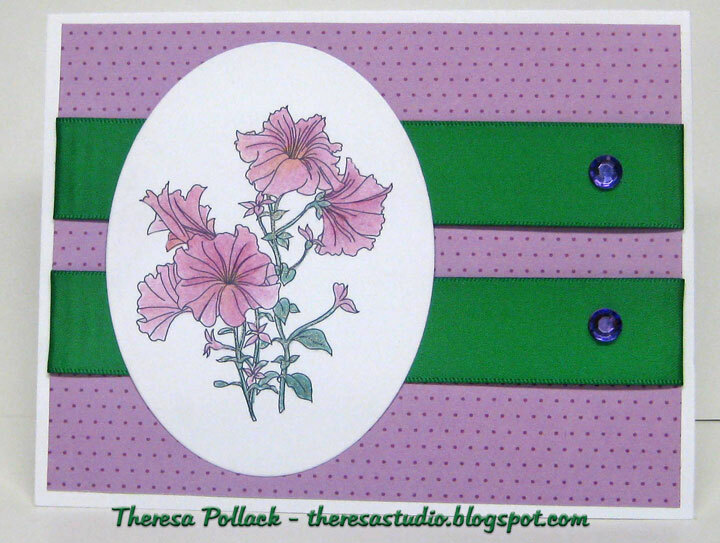 I chose to use "Petunias" on my card. I colored the image with pencils and OMS and added a little glitter to the leaves and stems. 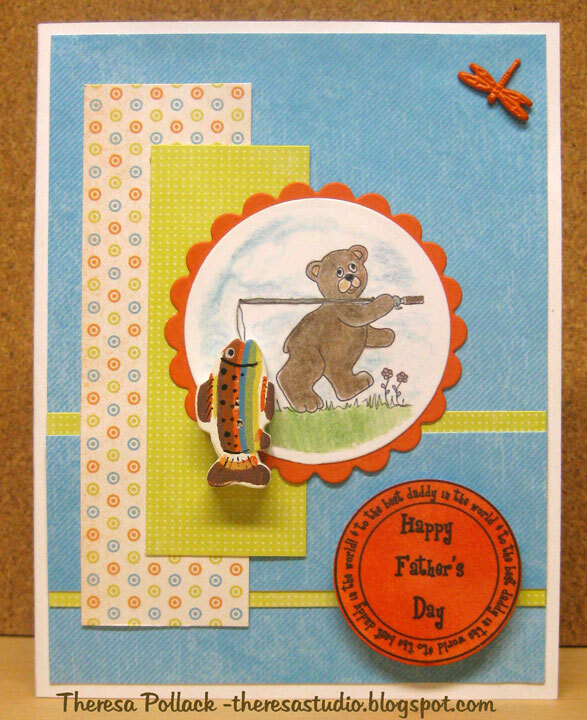 Used nesties oval to cut out and placed on the card over two ribbon stripes on dotted mat. Added a couple of rhinestones and here's the finished project. Enjoy the lovely flowers in bloom at this time of the year. 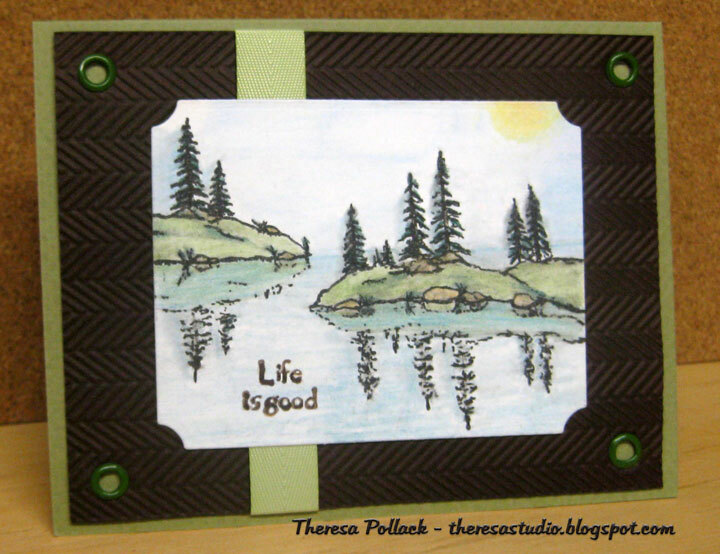 "Life is Good" is another Gina K Design stamp set by Theresa Momber that I have not used that much since I bought it so I am going to use the lake scene for this challenge from Linda at Stamp TV. Her Blast from the Past challenge is to use colored pencils and OMS. This is my most used coloring method since I don't own any Copics. I tried to get some shading in the sky and water and to create some shadows from the sun hopefully in the right direction. I have not done many scenic cards so this was a stretch for me using pencils. 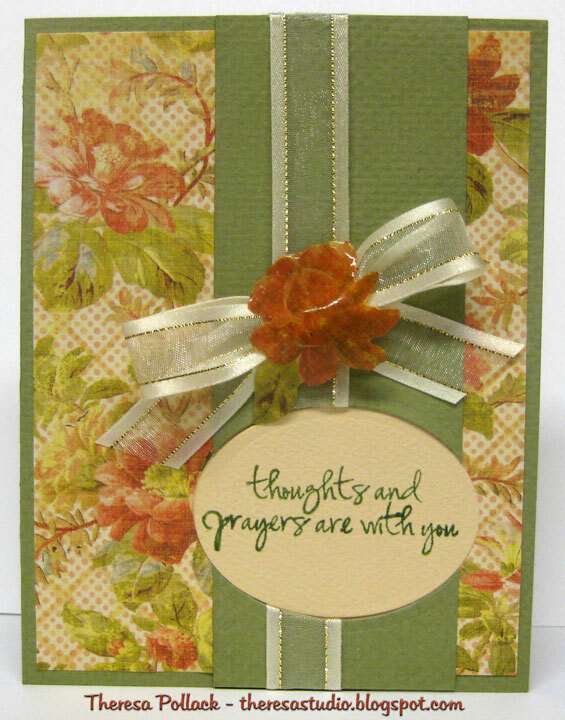 I cut the colored image with a Spellbinders label and finished the card with a simple mat of brown embossed and added ribbon to the mat and green eyelets to each corner. Think this came out as a very masculine card....a nice change from all the flowers that I do. I do hope your life is as good as the one I share with my DH. We are so fortunate to be happy and healthy in our life together. I won a stamp set from Melanie, her latest one, "Candles on Your Cake" and have been anxious to use. 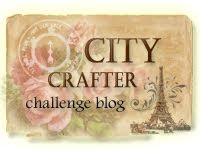 Check out Melanie's blog for her lovely creations. 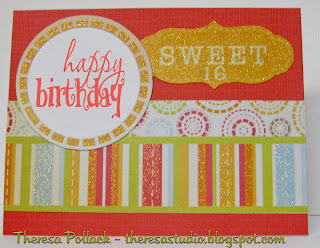 http://melaniemuenchinger.blogspot.com/ Following Melissa's sketch from Stamp TV's challenge , I created this card. Love how the layered cake with candles on a silver platter came out...easy to stamp.Very disappointed in the photo...colors not right and rhinestones do not show very well. I will write in a name to the birthday song when I decide to which special person I will send this card. 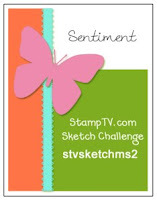 Carla's color challenge for Stamp TV last Monday was to use orange, pink and green (and neutrals, if needed). As I do not use much orange this was a stretch for me. I used the sketch from Beary Sweet challenge to get me inspired. I used a stamp from GKD "Elegant Flowers" one of my first sets from her. Stamped with Memento New Sprout and SU Only Orange on GKD PL White. Colored this with pencils and OMS and added some glitter with Sakura Clear Star pen to stamen, petals, and leaves. Used base card of GKD PL Creme de Menthe. Cut one mat of GKD PL Innocent Pink and embossed with CB EF Leafy Branches. Inked raised areas with green and added glitter to leaves. The other mat is DCWV patterned paper already glittered. Used pink mats under each . Added photo corners that were also from DCWV. 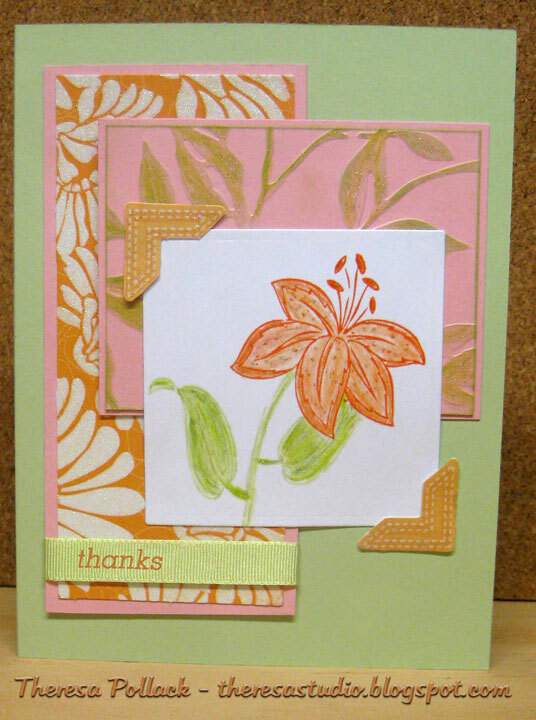 Finished with a ribbon stamped "Thanks". Hope today is a beary sweet day for you! I just love this new site, Simplicity, and their One Layer Challenges that I found last week. 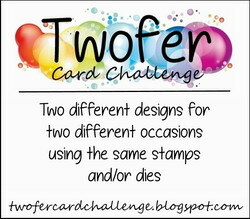 Susan's challenges are so great and it's fun to make these simple cards. Check it out here. Her challenge this week requires you to create a mask and use it to create a background on your card. 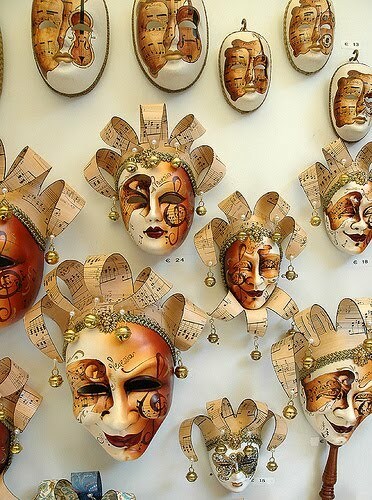 You can punch, cut, diecut, or use a found object to create your mask. I used Spellbinders Label 9 to make my mask and sponged the area with SU So Saffron. I stamped the Cattails and sentiment, both GKD stamps from the set Life Is Good, with Memento Rich Cocoa. Such a simple but a great masculine card. Will enter this in Operation Write Home challenge to make a masculine card. Think the sentiment on this card will make it a great card to include in my next shipment to OWH. 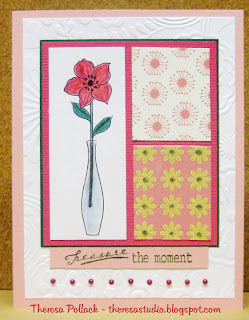 This card was made for the sketch challenge (shown below) at Annabelle Stamps. We can use any stamps and bling that we wish. 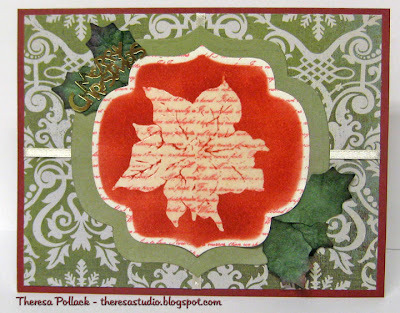 I decided to use a digi stamp that was free at The Creative Cottage who has a challenge at The Creative Cottage Challenge Blog in which I am also entering this card. I printed the digi image of the vase and colored with pencils and glitter pens. The flower is pink but looks more red in the photo. I also added Glossy Accents to the vase. I cut blocks of patterned paper that have glitter and mounted these and the vase on a mat of dark pink matted with green. 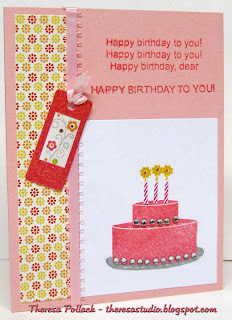 This went on a white mat dry embossed with CB folder and then placed on pink card base. Finished with a sentiment and pearls. Cupcake Craft Challenge: use something sparkly on your projects. Catch of the Day...A Whopper! At There's Magic In The Air, Jessie brings us a challenge to use the sketch (lower right) as well as the image "Catch of the Day" (free this week here) from Paper Cupcakes. So off I went fishing for paper, embellishments, sentiments, and ideas and came up catching the biggest fish that I could. I colored the image with pencils and OMS, cut with nesties circle and matted on a scallop circle. I have had these fish buttons forever and thought this would be a great card to use one. I also ran some heavy thread on the pole to add some dimension and interest but it hardly shows in the photo. Added a dragonfly brad....always see those when you go fishing. 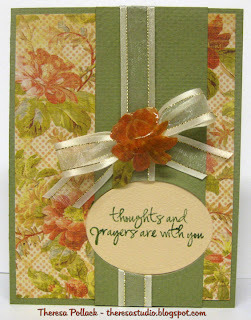 Added a digital sentiment from Creative Cottage, their June Freebie here. I printed the sentiment, punched out with a circle punch and sponged orange. I assembled the card elements following the sketch layout and hung the fish button from the line over the actual fish that was there. I should get a prize for bringing in such a big fish on my card. Ha!! Sentimental Sundays: New or neglected stash....have had the brad and button for many years. 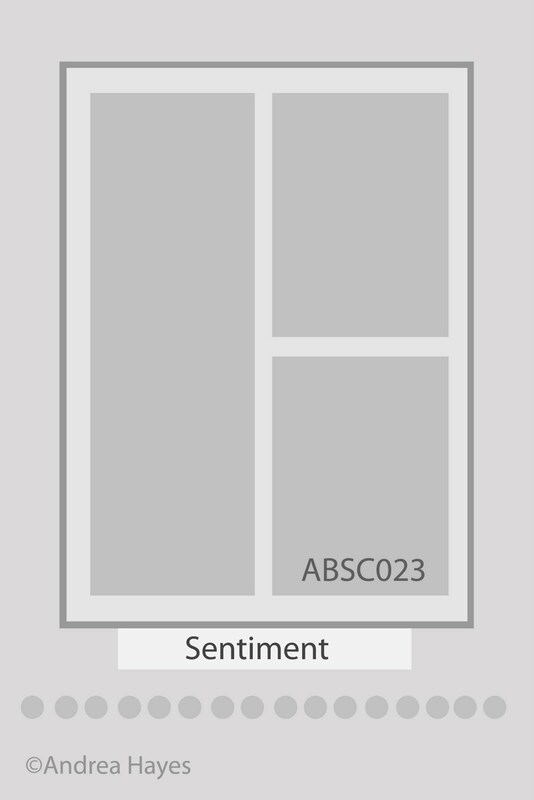 Use a sentiment on card. 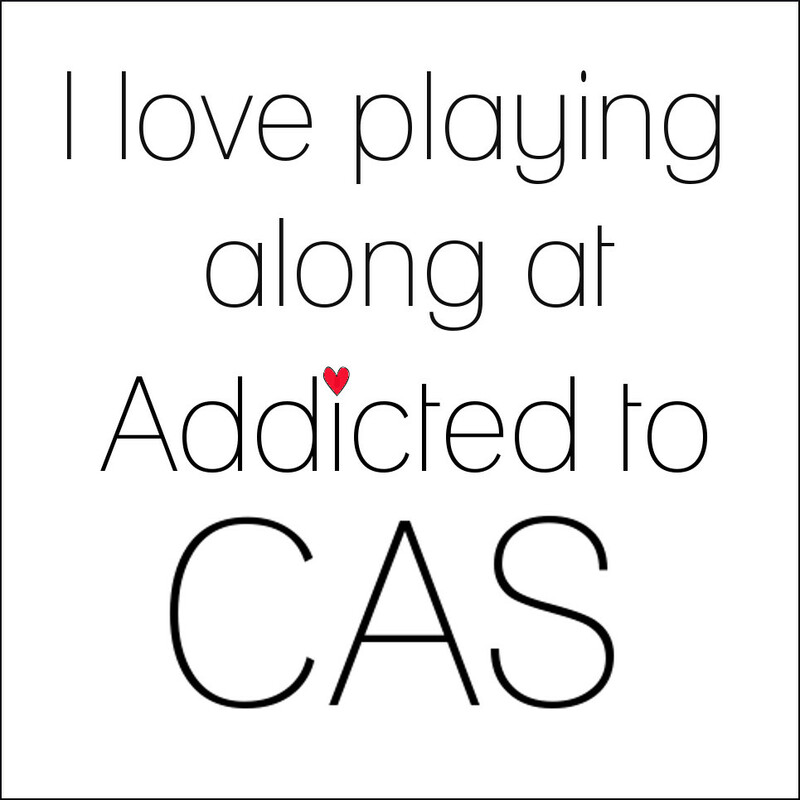 Cas-tastic Challenges: Button, Button... Who's got the button? is their challenge. The only fish I've caught lately was in the supermarket but I love fresh fish just caught. Would love to have a old fashion fish fry with hushpuppies and all the trimmings. Making me hungry.